Thanksgiving is only a few days away and everyone is in a flurry activity. I feel like I have been in a personal whirlwind the entire month of November and I have neglected to post here as I planned. But I have been cooking up content for Apartment Therapy and if you will indulge me, I’d like to serve up the leftovers! 2. 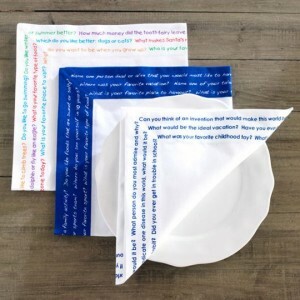 Bonus conversation starters and fun finds: Children’s Recipes Disposable Placemats have recipes written from a kid point of view on a rich striped background. Super cute. I found these quote bubble plates at MOMA and thought they would be such a cheeky addition to the dinner table or cocktail party. They practically beg you to fill in the conversation blank. 3. My first House Tour on AT was actually a Studio Tour with Leslie Bonnell at the amazing new Stitch Lab. If you are lucky enough to be in Austin, I highly recommend you pay Leslie and the other teachers a visit. 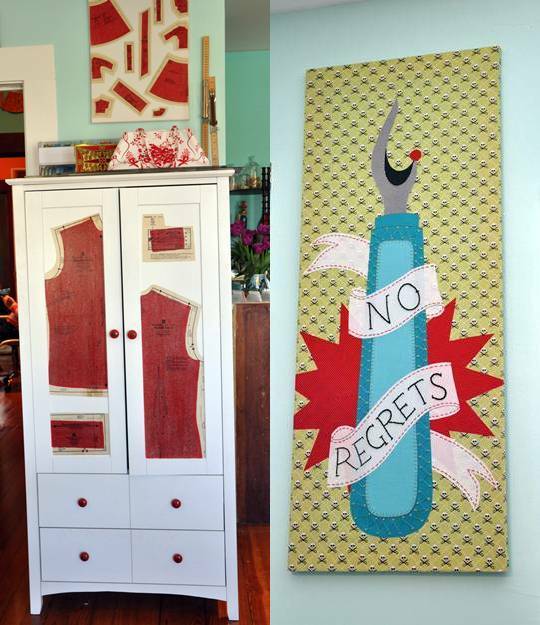 The joyful studio and gorgeous fabrics are excuse enough, but you should really sign up for a class. You know you want to . . . deep down in your crafty heart. The Stitch Lab has classes for making unique, easy Christmas gifts and decor — and best of all, the teachers are fantastic. Even if you weren’t born with a thimble on your finger, they will make you feel like you can sew.